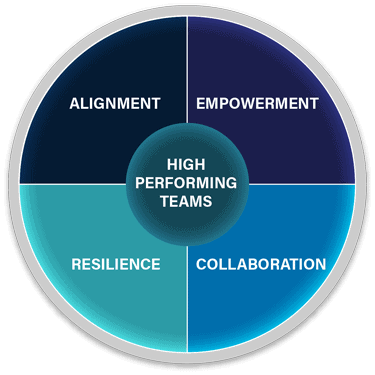 Evans’ High Performing Team (HPT) tools and techniques improve team performance and enable your team to realize its goals by making the complex and challenging simple and solvable. How can Evans help you develop a High Performing Team? Lead your team through the development of a team’s shared purpose to ensure alignment and success. Evans will step you through the process to define your team’s charter and team goals through our value-based approach to engagement and facilitation. Help design your team to support its purpose. Once you know the pathway for your organization, we can help you ensure the most critical tools for your journey are ready: your people. We will help you ensure that every employee is aligned to the future. Assist in improving engagement among team members to enable effective decisions and to inspire action. Through facilitated sessions, collaborative improvement projects, and targeted consulting, members will remain empowered and informed as they address organizational challenges. Build your team’s resilience to change. Success does not end at the creation of a high performing team. We will ensure that that your teams have the tools to engage one another effectively and to thrive during complex changes. A major federal agency asked Evans to lead a strategic renewal of a one of its main programs essential to the functioning of the agency’s mission. Where Can Your Team Grow? Take our quiz and discover quick wins to enhance your team’s performance.